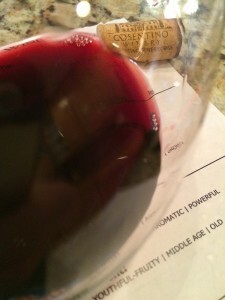 Last spring I had written about a Select Red wine that came from Cosentino Winery. In my blog I pointed out some issues that I saw and thought the wine was not the same quality as the other wines we are familiar with and drank for many years. We did send Cosentino a letter expressing our concerns and the tasting room manager replied back. We will be in Napa with friends the first week of October. I hope the new wines are as good as the wines Mitch Cosentino used to make. My understanding anything 2010 and older were made by Mitch. I am not sure who the wine maker is now that Mitch is gone. 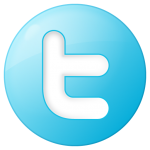 Medium color depth, purple hue. Very aromatic, young-fruity with aromas of red fruit, caramel, vanilla, chocolate, spice. Dry, full-bodied with balanced acidity. The tannins were medium, soft. Rich mid-palate flavors with a soft long finish. Sourced primarily from our vineyards in Calistoga and St. Helena, the 2012 harvest yielded a bountiful crop, as well as high quality fruit. This new release was aged 20 months in French Oak barrels; 45% new. 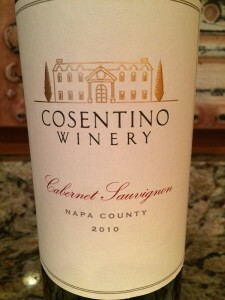 I rated the 2010 Cosentino Cabernet Sauvignon three glasses. I was happy to drink this wine and brought fond memories of other wines from Cosentino that we have drunk over the years.